Another day, another endless lawsuit against the Affordable Care Act’s contraception coverage mandate. Court after court has ruled that the Obama administration has found an acceptable workaround for nonprofit religious organizations who don’t want to provide birth control coverage to their employees. Nonetheless, yet another case will be decided soon in Denver, brought by the Little Sisters of the Poor. As the New York Times notes today, four federal appeals courts have ruled that the Obama administration’s contraception compromise is acceptable. If religious nonprofits don’t want to provide birth control coverage, they fill out a short form opting out; contraceptive coverage is then provided directly by the insurer, without going through the employer. 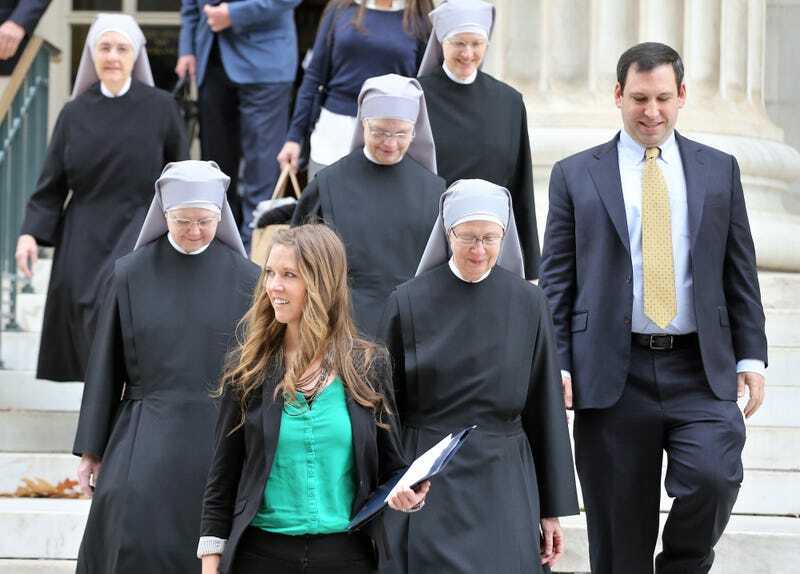 Although the government does allow exemptions for church and church-type entities from the HHS Mandate for religious reasons, this accommodation does nothing for the Little Sisters. Because the government refuses to classify them as a “religious employer,” the Little Sisters are required to hire a third party to provide these objectionable services to their employees, and thus are still forced to participate in the government’s scheme. Believing that every human person has God-given worth, the Little Sisters cannot provide contraceptive, abortion, and sterilization services that go against their religious beliefs. The issue for the Sisters seems to be that the federal government has to use information from their healthcare plan in order to provide contraceptive coverage, which they argue makes them “complicit.” They also want to be classified as a religious employer, not a religious nonprofit. A video produced by the Becket Fund claims that the government has decided they are “not religious enough for a religious exemption,” which is a pretty misleading way to word things. A hearing in the case was held last December at the 10th U.S. Circuit Court of Appeals in Denver, and it could be decided at any time. But as Emily Bazelon pointed out last year, this whole thing could be an “empty exercise,” given that the Little Sisters’ third-party healthcare administrator is another religious entity, one called Christian Brothers Services. They also can’t be required to provide birth control coverage. The Little Sisters lawsuit is actually a class action, asking that anyone who gets insurance through the Christian Brothers not be required to cover or opt out of covering birth control. [T]he law still forces the Little Sisters to participate in providing access to the drugs and treats the Little Sisters as second-class citizens. First, the government has refused to simply exempt the Little Sisters—even though it exempts churches and other religious organizations. That is wrong—the Little Sisters should receive the same exemption churches do. Second, the so-called “accommodation” still forces the Little Sisters to find an insurer who will cover sterilization, contraceptive and abortion-inducing drugs and devices, and will provide related counseling and education to promote those things. The Sisters would also be required to sign a form that triggers the start of that coverage. In good conscience, they can’t do that. So the “accommodation” still violates their religious beliefs. The upshot here is that even if the court rules against the Little Sisters, they will still probably find a way to delay letting their employees get access to contraception, or even avoid it entirely. Just as Christ would’ve done.